This fall we partnered with nine DIY bloggers to bring you holiday themed products with our crates! Our Sawdust & Snow Campaign kicked off in mid November. Half the fun of the Holidays is crafting and decorating so we couldn’t be more excited to share with you these festive projects. Be sure to visit these bloggers’ sites for a chance to win a $50 gift card to Home Depot. Bloggers will also need your help - VOTE for your favorite project on www.RYOBINation.com. The Blogger with the most votes will win a $750 prize package from RYOBI Nation. Right now you can find our products in Home Depot, Walmart, and now Joann Fabrics! Check out our Products Page for more details. We’re drooling! Alison Ogden from The Pink Tumbleweed created this beautiful, mouthwatering Thanksgiving Dessert Buffet using just two large crates and one small crate. Crates are the perfect piece to add a little something to your holiday display. Stain and stack them to match your holiday table décor and maximize your space for more food. For project details, visit Alison’s blog and read her post, here. It’s time to deck the halls and bring out those Christmas Displays. Katie Cleveland from Addicted 2 DIY puts a modern twist on this old tradition with our large crate and square crate. Crates are perfect to create miniature Christmas scenes. Stain them to match your home décor or keep them unfinished for a modern look. For project details, visit her blog and read her post, here. Don’t let the stress of holiday gift-wrapping overwhelm you! Amy Rattleff from Highstyle Restyle built this handy giftwrap station and used two large crates as drawers. This is a great way to stay organized during the holidays. Customize it to your specific needs. For product details and build plans, visit Amy’s blog and read her post, here. 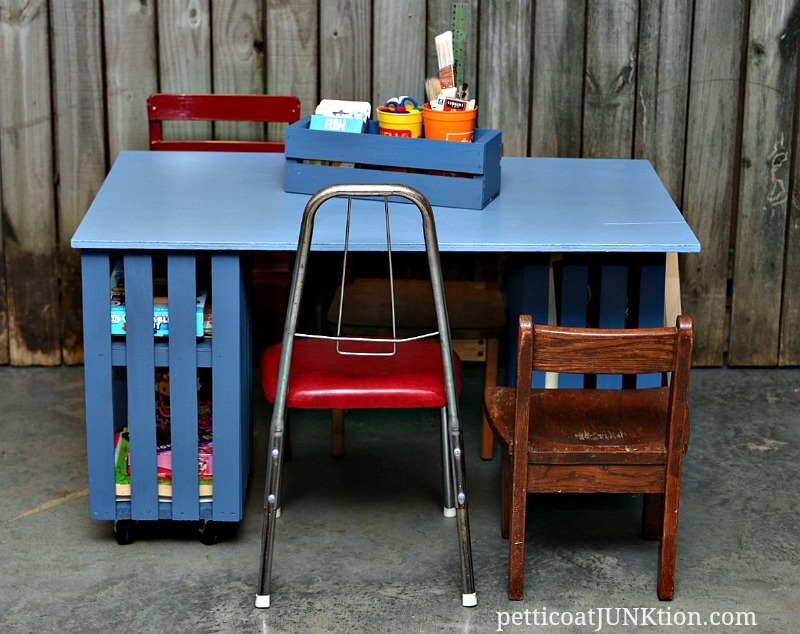 Kathy Owen from Petticoat JUNKtion built this awesome kids table using just two large crates. Suddenly the Kids Table is the cool table! Use this table as the kids’ table for holiday gatherings. Better yet, you can use it year round for homework or arts and crafts. For more project details and build plans, visit Kathy’s blog and read her post, here. Here’s a twist on the infamous Radio Flyer Wagon for Christmas by Jenna Leferon from Rain on a Tin Roof. Check out red, green, and blue crate wagons! Fill them with presents and what kid wouldn’t be excited to see these festive wagons on Christmas morning? Perfect for to use as a gift basket or to add to your holiday décor. For product details and instructions, visit Jenna’s blog and read her post, here. Melaine Thompson from My Sweet Savannah made this great coffee table centerpiece with one half crate. The half crate makes a great hostess gift or serving tray for holiday parties. Curl up and read your favorite holiday book - She also made this cozy little nook with our square crates as a bookshelf! For project details on her centerpiece click here and for her bookshelf click, here. Amy Latta from One Artsy Mama made this Advent Crate. There are a lot of different spins on Advent Crate and this one will have all the kids excited. Starting December 1st have your family open one small present until Christmas. Decorate your crate with a meaningful message for your family. For project details, visit Amy’s blog and read her post, here. Amy Geib from Always Never Done made a Wall Storage Mini Mudroom with four half crates and one large crate. While it may not snow much here or get below freezing for long in Atlanta, it doesn’t stop us from piling on the layers! Don’t let all your winter weather gear be a sight for sore eyes. Keep it organized with our crates. For project details, visit Amy’s blog and read her post, here. 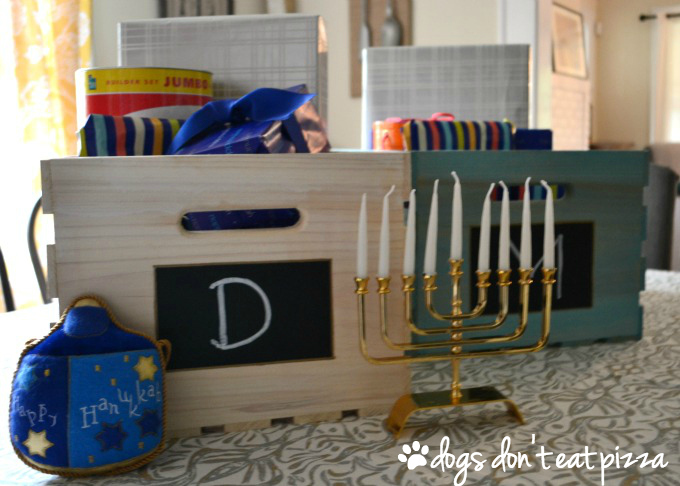 We know the 8 days of gift giving for Hanukkah can get crazy which is why Karen Cooper at Dogs Don’t Eat Pizza made these personalized gift crates for her kids. You’ll keep everything in place with these crates and they can use them afterwards too! For more project details and to read her blog, click here.